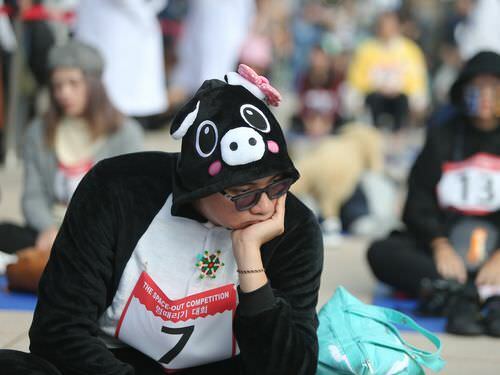 Taipei, Dec. 10 (CNA) A "space out" competition was held in Taipei Sunday with the aim of promoting a stress-free lifestyle by encouraging people to stare off into space without talking, sleeping, eating or using any electronic devices. The "space out" competition, created by South Korean visual artist Woops Yang in 2012, has a local edition that is held in South Korea and an international version that moves to different countries in the world. This was the first time its international version has been held in Taiwan. It is a contest to see who can stare into space the longest without using smartphones, losing focus or dozing off. The Taiwan edition of the competition took place at Eslite Spectrum Songyan Store in Taipei Songshan Cultural and Creative Park after it was postponed for more than a month due to poor weather conditions. It was designed to highlight how much people overwork their brains and how much they stand to gain by taking a break, Yang told CNA Sunday. Yang said she created the "space out" event back in 2012 after observing that people were overworking themselves and using the money they earned to buy luxury items. People spend most of their time trying to meet their material needs, she said, adding that he often wonders why they do not treat their time as a luxury. In South Korea, the "space out" contest has gained the support of the government, which now provides sponsorship, as it is encouraging people to relax their brains for a while, Yang said. 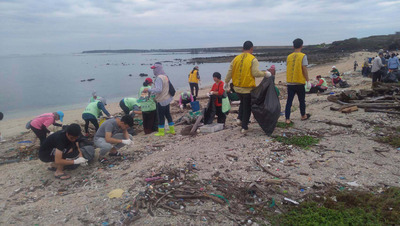 The "space out" competition in South Korea is usually held in a large park in a downtown urban area, Yang said. A bird's eye view of the scene highlights the stark contrast between the relaxing and tranquil atmosphere at the venue and the hustle and bustle on the nearby streets, she said. Yang told the participants before the event Sunday that they were not just competitors but also artistic performers since the competition was first created as form of installation art. The very essence of the competition is to not worry about what others might be thinking, she told the participants. "People of all ages need to zone out for a while," she said. Yang, however, has not yet taken part in any of the contests, which are now in their fifth year. "I'm not good at spacing out and that's why I created this -- to let people zone out," she said with a laugh. The 80-minute competition in Taipei was won by Chan Kai Ho (陳棨豪) from Hong Kong, a 24-year-old student at the Hong Kong University of Science and Technology. Chan arrived in Taiwan on the same day of the competition. Being unfamiliar with the country, he didn't expect to gain any votes and become the winner. The audience could vote for the contestants by using red dot stickers and put them on a board which had a system of representing each individual competitor. The secret of winning the competition is to "find a place to look at and keep staring at it," said Chan as he explained how he made himself really still during the competition. "Even when a fly flew onto me, I didn't move," said Chan. The organizers of the event said the rule was that the contestants were not allowed to talk, sleep, laugh or use their mobile phones during the competition. Each contestant will receive a yellow card for their first penalty and is followed by a red card for their second penalty, which eliminates them from the competition, said the organizers. Nowadays, people have a lot of pressure and hopefully they can save some time for themselves to think over what they really want in life, said the organizers. Some contestants strategically wore animal costumes while some used sackcloth to set up tents in an attempt to disturb other contestants. A contestant wearing an animal costume. 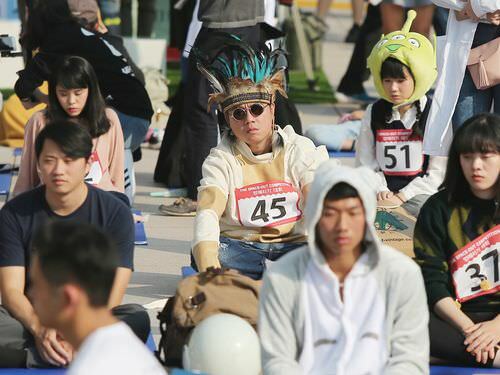 Hong Kong movie director Pang Ho-cheung (彭浩翔) also took part in the competition wearing a feathered hat. Immediately after the competition, he said "it's hot."